Quantum cryptography is the art and science of exploiting quantum mechanical effects in order to perform cryptographic tasks. While the most well-known example of this discipline is quantum key distribution (QKD), there exist many other applications such as quantum money, randomness generation, secure two- and multi-party computation and delegated quantum computation. Quantum cryptography also studies the limitations and challenges resulting from quantum adversaries—including the impossibility of quantum bit commitment, the difficulty of quantum rewinding and the definition of quantum security models for classical primitives. 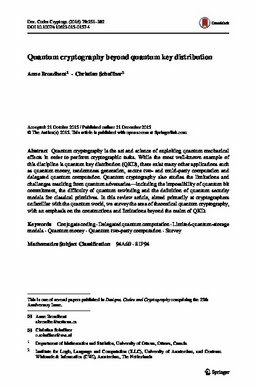 In this review article, aimed primarily at cryptographers unfamiliar with the quantum world, we survey the area of theoretical quantum cryptography, with an emphasis on the constructions and limitations beyond the realm of QKD.